It's the last day of April and still having those April showers for May flowers though it looks like maybe they will let up for a while soon. My image today goes back to the beautifully kept No. 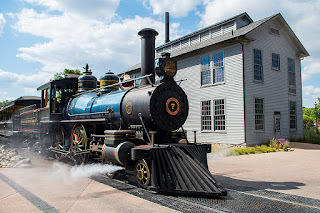 7 locomotive at the Greenfield Village of the Henry Ford Museum in Dearborn Michigan. I just love the color of this locomotive and they keep it spotless even though it is a coal fired locomotive which can be a bit difficult. 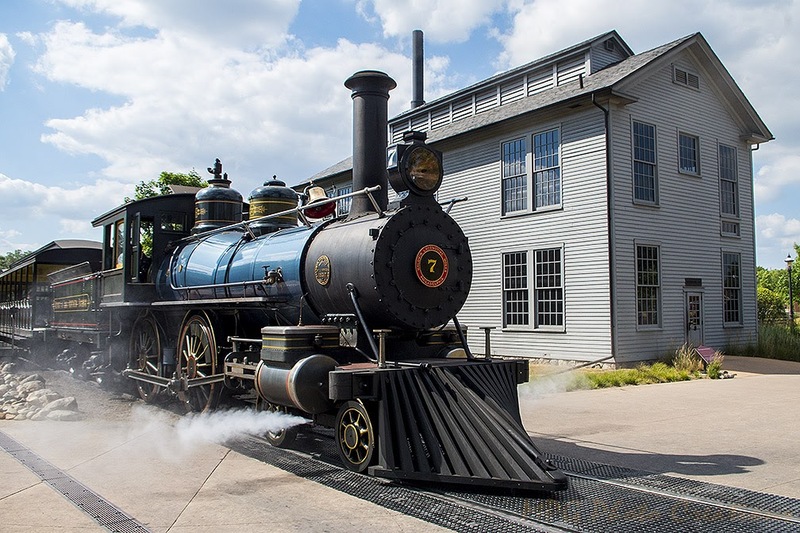 It is one of 3 locomotives that they run. Each one runs for 2 weeks at a time, then goes in for maintenance while another runs for 2 weeks, goes in and so on. It runs around the park all day and you can ride as many times as you like for just 5 dollars. Well worth it I thought. I captured it here pulling out of one of the stations on the grounds.